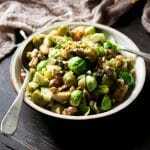 Delicious sauteed brussels sprouts with dates and walnuts, a glorious, festive side perfect with any roast dinner. This easy recipe is ready in around 30 minutes and is so delicious with roast dinners and vegetarian mains. Brussels sprouts are almost an obligatory side dish to every Christmas dinner, however, they are often overcooked, boiled to death, mushy and not very appetizing. 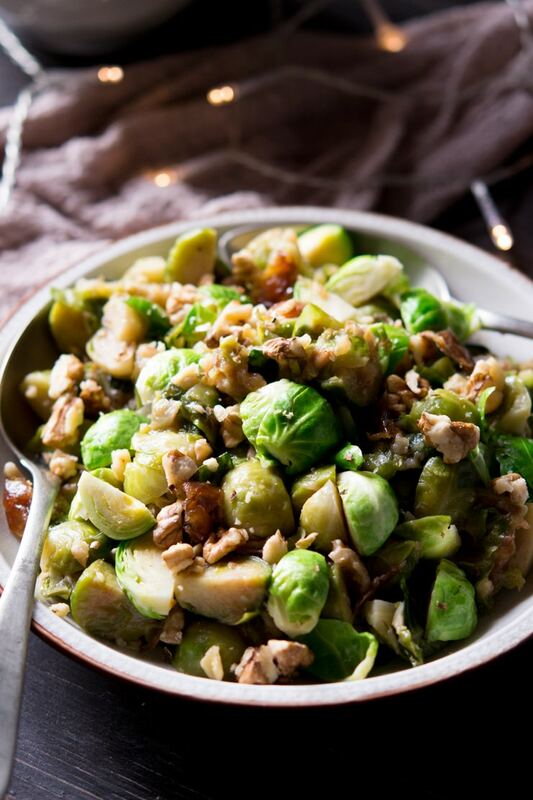 This easy sauteed brussels sprouts recipe will renew your faith in the humble veg, made with chicken stock, sticky and sweet dates and chopped walnuts they are truly delicious. Ok, so I am so excited right now! For years I have hated Brussels sprouts yet envied everyone that liked them. I tried so hard to enjoy them, but I always found them overly bitter, tasteless and unexciting. BUT at last that has all changed and I can now officially say that I like Brussels sprouts and not only do I like them but this new recipe is one of the best side dishes I’ve had in a long time, seriously! I was testing out a new roast pork recipe (coming soon) and decided I’d try out some new side dish ideas too. I strangely decided to give Brussels sprouts a go and I’m so glad I did. I knew I wasn’t going to boil them, nope, no chance. I cut them into quarters, removing the white stalky part underneath (the white stalk is very bitter) and decided to saute them with some stock and dates that I had planned on making a cake with. For extra texture, I added some walnuts in at the end and omg…so, so damn delicious! Cut as much of the white stalk off at the bottom of each sprout then cut them into quarters, lengthways. Finely chop a shallot and add it to a large frying pan with a little olive oil and butter. Saute the shallot for a minute then add the chopped Brussels sprouts. Saute the sprouts, stirring occasionally for a few minutes then add the chicken stock and let it simmer for 5 minutes until the sprouts are tender and the stock has reduced. Add the chopped dates and a handful of walnuts and stir together. The dates will coat the sprouts a lovely sticky sauce, continue to cook the mixture whilst stirring for a few minutes then remove to a serving plate. Sprinkle with some more chopped walnuts and serve. Finely chop a shallot and add it to a large frying pan with the olive oil and butter. 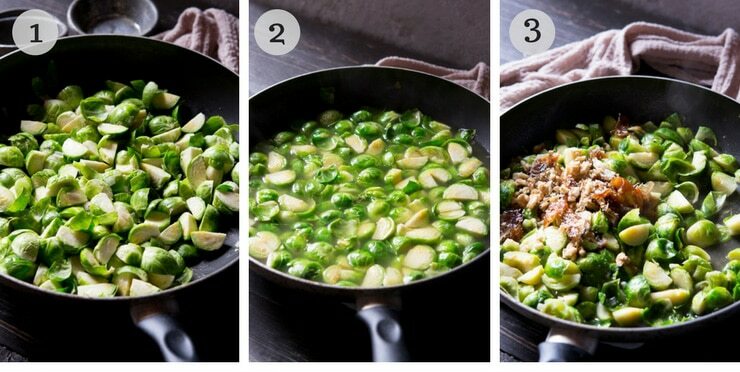 Sauté the shallot for a minute then add the chopped Brussels sprouts. Sauté the sprouts, stirring occasionally for a 2-3 minutes then add the chicken stock with a pinch of salt and pepper and let it simmer until the stock has reduced by half and the sprouts are tender. 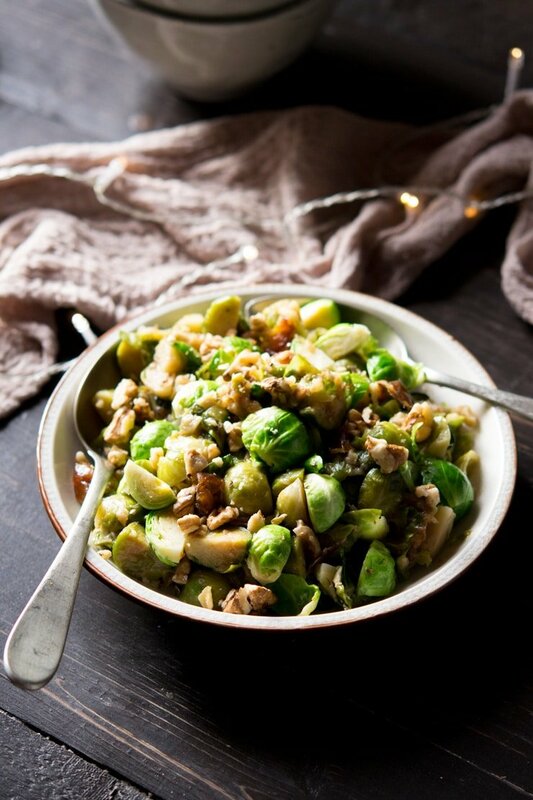 Using your fingers tear the dates up into chunks and add them to the sprouts with 1 tbsp of walnuts and stir together. The dates will coat the sprouts in a lovely sticky sauce, continue to cook the mixture whilst stirring for a few minutes then remove to a serving plate. Thanks so much Angela, so glad your family loved it!